FOS’s Arlyne Johnson and colleagues Paul Frederick Eshoo, Sivilay Duangdala, and Troy Hansel find that an ecotourism direct payment approach for wildlife sightings reduces illegal hunting. Vientiane – Lao-PDR (2017) – A new study by the Wildlife Conservation Society (WCS) and Foundations of Success (FOS) finds that an ecotourism strategy based on “direct payments,” where local people are compensated for the amount of wildlife seen by tourists, has resulted in a reduction in illegal hunting and an increase in wildlife sightings. 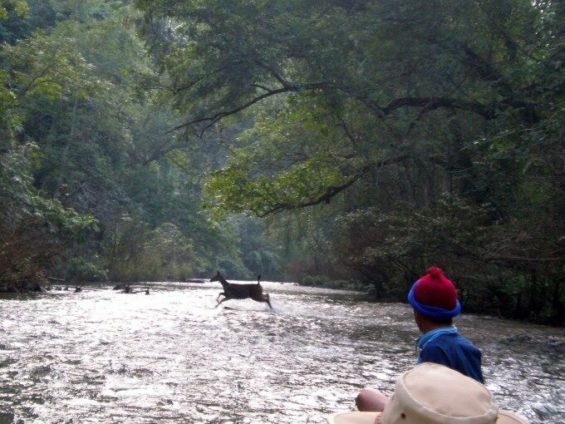 In the study, the scientists tested a new model in Lao People’s Democratic Republic (PDR)’s Nam-Et-Phou Louey (NEPL) National Protected Area (NPA) that used a direct payment approach to encourage villagers to reduce illegal hunting and trade, which is driving wildlife decline. The model included a contractual payment to villages that was directly tied to the numbers of wildlife seen by eco-tourists as well as a reduction in payments for occurrences of hunting violations. The approach was designed to reduce illegal hunting pressure, increase wildlife sightings, and ultimately wildlife numbers, while generating ongoing economic incentives for conservation. The scientists implemented and then monitored this approach for four years. Results indicated a three-fold increase in hunting signs in the non-tourism sector of the NPA as opposed to no increase in the ecotourism sector. Additionally, an overall increase in wildlife sightings was observed. A wide range of threatened species benefited from the program, including Sambar deer, barking deer, primates and small carnivores. “This study illustrates the importance of monitoring along a theory of change to evaluate if and how a conservation strategy is leading to expected outcomes and to inform adaptive management,” said WCS Lao PDR Country Deputy Director Dr. Santi Saypanya. This project was supported by funding from the United States Fish and Wildlife Service Rhinoceros and Tiger Conservation Fund, the European Union, the French Agency for Development (AFD), the German Development Bank (KFW), the French Facility for Global Environment (FFEM) and the Global Environment Facility (GEF).